Data is the new vehicle. Here are your top driving tips. Data will drive the real estate transactions of the future. The writing is on the wall. If your business, at the office or franchisor level, is not collecting data, with a real-tech strategy in place to harness and leverage that data with scale, you are being left behind. Make no mistake: the race is on and it won’t be long until you’re lapped. For agents who don’t plan to stick their head in the sand, Laing+Simmons has come up with the top driving tips to steer through the new, uncharted real estate landscape. Most franchisees who ask their franchisor what their real-tech strategy is will be met with a blank response. The worrying fact is the real estate industry is dangerously under-prepared for the onset of artificial intelligence (AI), the scope of real-tech’s potential and its capacity to disrupt. Change is upon us and the industry 24 months from now will be vastly different. It began with solutions to relatively simple problems. For example, a tenant encounters a maintenance problem in their rental property. They take a pic on their phone, the issue is automatically logged, a job is triggered with a tradesperson, who can access the property with a digital key, and the problem is fixed more efficiently without a property manager involved at all. This is the tip of the iceberg. There are AI programs that can predict with surprising accuracy when people will want to sell and what they’re looking to buy. AI has already penetrated the real estate industry and it will rapidly expand as it has in other industries around the world. Laing+Simmons Network Growth Manager Travis Wentriro says at the crux of the movement is an increase in consumer expectations as to what constitutes ‘great service’. “AI is driving increases in consumer expectations, so harnessing global trends to improve real estate services is something the industry has no choice but to embrace. The concept of having to wait for information or for a reply to a question is increasingly implausible for consumers today,” Mr Wentriro says. Laing+Simmons, through its parent company Dexar Group, has invested in real-tech resources to the point where the Dexar head office is now vastly different to a traditional franchisor, with a data analyst/scientist employed full-time along with other data resources. The company has produced a detailed white paper on how artificial intelligence and the power of big data will shape real estate in the future. It can be downloaded here. Real estate is a people business and developing solutions for problems that customers may not yet have encountered is not a new concept to the best operators. Preparing several steps ahead is simply good customer service. But AI has upped the stakes. Machines that are capable of learning are reshaping real estate now. For agents wanting to stay ahead of the curve, collecting and leveraging data can not only help them understand what their customers want to know, but also provide the answers. Dexar Group Chief Operating Officer Jeff Gray says scale is key. “Predictive analytics, drawing on historical data sets and applied to current consumer behaviour in real time, enables us to anticipate the real estate service that a consumer may want. Over time and over very large data sets, the accuracy of these predictions is vastly improved,” he explains. “Similar to recommendation engines that Amazon and Netflix use to predict what you may want to purchase or content you may want to watch, predictive analytics in real estate can anticipate the services a given consumer will desire at a specific time, using the channel they prefer, based on their online behaviour and past experiences. Privacy is a critical concern when real estate businesses are developing their real-tech strategies. Ultimately, consumers own their own data and many are increasingly concerned about their privacy. Research shows consumers are willing to exchange data, but only if they have a valid reason to do so. A real-tech strategy must understand this and present them with a compelling case for sharing, perhaps through better, more personalised experiences. Unsurprisingly, it comes back to the customer experience. In this regard, in the real estate landscape of today and tomorrow, humans and AI must work together to deliver the best possible outcomes. The concept of a data lake means a breadth of data collection that is fluid, ever-expanding, and your experience with your customers is what enables the lake to grow. The more it grows, the broader the application for everyone who has access to it, and the better you’ll be able to look beyond your customers’ immediate needs to deliver their future wants. But most real estate businesses are ill-equipped infrastructure-wise. The machine parts aren’t there to leverage into something bigger. A substantial agency CRM database of as many as 200,000 contacts is insufficient scale to leverage into a real-tech solution, as impressive a number as it may be. Travis Wentriro of Laing+Simmons says when it comes to real-tech, most agents don’t know what they don’t know. “Big data will enable agents to understand more about consumers and properties, down to a fine granular detail. It means they can personalise the consumer experience en masse and develop new, scalable service offerings and business models that deliver a valuable, frictionless service to customers,” Mr Wentriro says. Having the right infrastructure capable of supporting a growing data lake can unlock significant new business opportunities for real estate businesses to create touch points to engage with prospective customers. The more you understand about consumers, the better you can predict what they want and need. Then you can create services around this insight. But it means understanding the potential value of data to turbocharge a real estate business, and investing in the means by which to actually do something with it. The most important driver of every real-tech strategy is the customer experience. Real estate has always been, and will remain, a people-first business, and the best applications of AI in real estate will enhance this proposition, not counter it. Robots and people are already working together on real estate transactions. In these initial instances, we’re largely talking about augmented experiences. 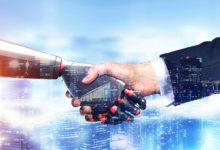 However, the concept of a ‘digital twin’ – a digital replica of a person, process, device or other system – will increasingly be employed on certain transactions or parts of a transaction. For instance, AI can already be applied to manage buyer and tenant enquiries in real-time, 24/7, through every interaction a customer wants to have until they want to engage with a real person. It can let you know as the agent when they want to engage, and the channel they prefer to engage through. When this occurs, with the advantage of the data you’ve collected, you’ll be armed with more information about that buyer or tenant than ever before. You’ll know them before you engage with them. Today’s Gen Z and millennial customers will increasingly expect properties to come to them. An effective real-tech solution will enable you to present your properties and services to these customers at a time and using the channel you know they prefer. Customers define the circuit, but you’re behind the wheel. Find out more on how artificial intelligence and the power of big data will shape real estate in the future by downloading the white paper here. 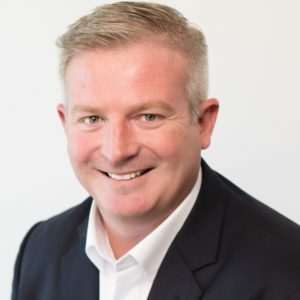 With a Master’s in Business Administration, Mr Gray has held positions with Domain Group, Aristocrat and Lexis Nexis, and has consulted with Qantas and HutchisonTelecom. He’s driven transformational change across various organisations and industries, recognising the power of big data and technology to personalise, automate and understand how best to engage with consumers. For more information about Dexar, head to dexar.com.au.